While not perfect, Olympus Has Fallen is a great popcorn flick that action-junkies will love. Director Antoine Fuqua gets the most out of a strong cast, which makes up for a weak plot and at times shoddy CGI effects. The premise of the film is pretty simple. Gerard Butler stars as Mike Banning, a demoted secret service agent tired of his desk job and the only man left to save the United States from terrorists. Banning finds himself alone in the White House after North Korean terrorists blow the hell out of Washington D.C. and every secret service agent imaginable. Can you say Die Hard 6? Butler, who finally finds himself a starring role that he excels at is aided by other strong performances in the film. Aaron Eckhart plays President Asher, and is very likeable in the role as the Commander –in-Chief. Morgan Freeman shows up in the film as the speaker of the house. He plays his usual authoritative role, when he is asked to step in as president when Eckhart is captured. Melissa Leo also has a strong performance in the film, as she plays the Secretary of State. One of the best scenes in the film features her taking one hell of a beating from bad guy Rick Yune. She also has another great scene a bit later as she is being released out of the White House. I actually found myself on pins and needles during that bit. Even with the strong performances, this is Butler’s show. He drops terrorists one after another, taking several out with quick head shots. He drops funny one-liners more than once in the film. Fans of the actor will finally get what they have been asking for, as Butler takes center stage as an action star. The film is not without its weak points, as the CGI isn’t always the greatest. The aerial attack on DC needed a much bigger budget, and really struggled to convince me that this was an all-out terrorist attack at times. Fuqua didn’t seem to mind the smaller-than-normal budget for action films, as he did a pretty good job and portraying the carnage that would be caused by such an attack. The plot is also thin, which is to be expected in action films. I felt that more time could have been spent on the relationship between the president and Banning, as well as the president’s son, but this is an action movie, not a love story. While this film will not win any awards for style, it’s a solid two hours of entertainment. 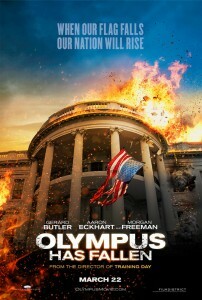 Olympus Has Fallen is a pure adrenaline junkie’s cup of tea. It will make you proud to be an American and probably make you want to stand up and recited the Pledge of Allegiance at the end.